Christy Callanan: Bravo Michael Quinlivan! Yesterday, Tipperary's senior footballers made the long trip to the 'Wee North' for the final group match in Division 3 of the National Football League. At the Athletic Grounds in Armagh, they took on the home county in a game that decided who got promoted to Division 2 for next year's competition. The winners would also earn a place in the divisional final next weekend against already-promoted Louth. 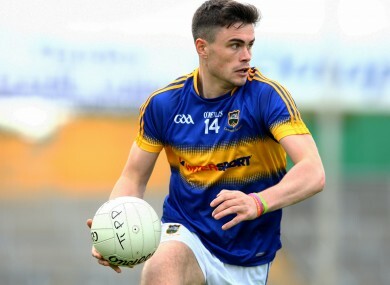 With so much at stake, Tipperary came away with a famous win after Michael Quinlivan scored a sensational goal in the 74th minute following a pass from Liam Casey. It was Michael's third goal —all scored in the second half — which proves the old saying: "Cometh the hour, cometh the man". Tipperary had already lost two home games in the league, which they had been expected to win, especially against Louth on the previous Sunday when they led by two points at half-time having played against the breeze in the first half. This left them with the the daunting task of travelling North to take on a team with an outstanding football pedigree in their own back yard. While Michael Quinlivan was the hat-trick hero on the day, the whole team played with similar heroics.The forwards had been scoring points freely in previous games, but on this occasion points were hard to come by, so the goals were vital. The backs upped their performance on this occasion, with the positional changes having the desired effect. So, it is hearty congratulations to players, management and last — but certainly not least — the loyal supporters wherein lies the true heart of Tipperary. On the same day, Tipperary achieved the expected win over Offaly in the National Hurling League Quarter Final at Tullamore. They now go on to play Wexford who were surprise winners over Kilkenny in the other quarter-final leg. Best of luck to both teams in their next engagements.